This much loved family- friendly and pooch friendly annual Festival is back on again and it has it all! The Concord Carnival will showcase an array of activities including a taste of outback life with whip-cracking, sheep-dog herding, cow-milking demonstrations, entertainment, old-fashioned games, amusements rides, plenty of kids entertainment and activities, market stalls and food galore! There will be plenty of live performances as well as entertainment ranging from sultry beats of Lolo Lovina's Gypsy Caravan, children live music performances including Fun with Franky and more. 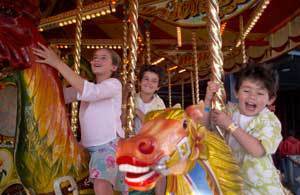 The kids will love the abundance of activities on offer such as the free amusement rides, petting zoo, craft activities, pony rides, workshops, classes, old-fashioned games such as egg-and-spoon, sack races, sport activities, and classes. Do not forget to register your little ones for the 'Get Kids Cooking' cooking demonstration and class, which includes cutting and peeling workshops, family friendly cooking demonstrations, food preparations, how to make sushi and more. The classes are for children aged five and over and will run around twenty minutes, every hour. Shop till you drop with the hundred market stalls on offer ranging from children's craft, handmade jewellery, sporting exhibitions, fashions, and more. Sink your teeth into the food stalls at the Carnival with tasty delights ranging from South American, European, Asian and more international cuisines. Dance and sing away with the live dance performances including local dancers performing everything from jive to salsa! There is also a senior's salsa dance class! Do check out the competitions happening at the Carnival which include the Petlovers Instagram Competition, Children's Colouring Competition, and Best Dressed Pooch Competition. With so much more things to enjoy, be sure to attend this Carnival as it will no doubt be one event not to miss out on. With so many things to see and do, everyone will be satisfied! Gather the family, bring your four-legged friend and do not forget the picnic blanket for a day filled with non-stop entertainment and fun. Why? The perfect family day out!